As a visitor, I remember being nervous and uncertain, but mostly I remember being eager--eager to find our "family," make friends, hear the Word preached clearly and powerfully, eager to worship, and eager to belong. When we weren't spoken to Sunday after Sunday, our eagerness deflated quickly. It still makes me feel uncertain when I think about it. Christine Hoover is the author of The Church Planting Wife: Help and Hope for Her Heart and the forthcoming book, From Good to Grace: Letting Go of the Goodness Gospel. 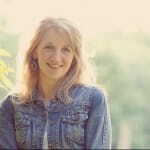 She has contributed to the Desiring God blog, In(courage), and Christianity Today, and blogs for ministry wives at www.GraceCoversMe.com. Christine and her husband Kyle, a church planting pastor, have three boys.